A pontoon boat comes to Washington, D.C. Representatives from the boating industry on Tuesday spoke before a panel of the International Trade Commission, weighing the impact of tariffs on different U.S. manufacturers. The ITC panel was meeting to decide whether Chinese manufacturers are guilty of dumping aluminum in the United States to the detriment of domestic manufacturers. 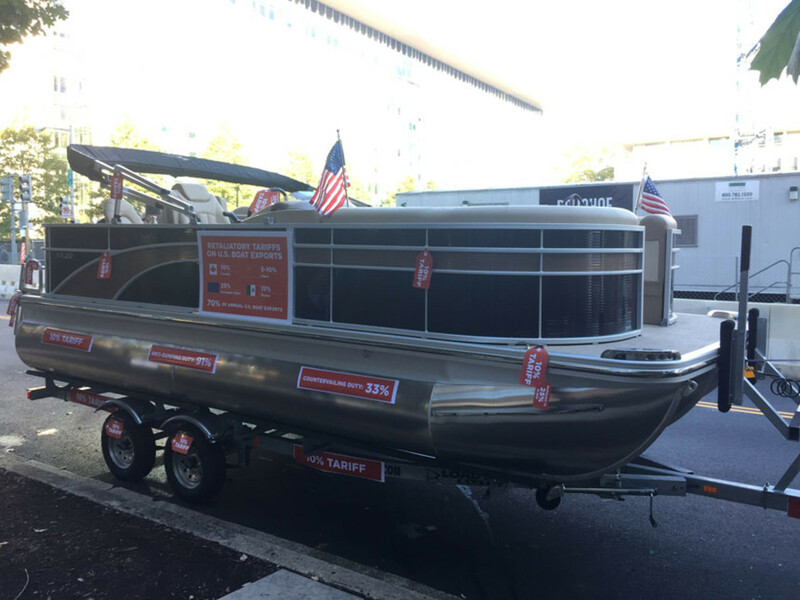 The National Marine Manufacturers Association not only testified about the impact of steel and aluminum tariffs on the boating industry, but it also parked a Bennington SX20 pontoon outside the building. The boat was plastered with stickers noting percentages of cost increases that can be attributed to tariffs by the Trump administration on imported aluminum and steel. Nicole Vasilaros, senior vice president of government and legal affairs, said that five of six members of the ITC panel went outside and walked around the boat during a lunch break. Vasilaros testified on behalf of the NMMA and the National Association of Trailer Manufacturers. Vasilaros told the committee that the combined effect of the ITC’s anti-dumping investigation has caused domestic prices of aluminum sheet to rise by 30 percent. “The marine industry maintains global supply chains, and over 350 marine-related products, components and materials are also being subject to this administration’s 301 action, with 10 to 25 percent tariffs imposed,” Vasilaros said, noting that Canada, the European Union and Mexico, accounting for 70 percent of U.S. boat and engine exports, have placed retaliatory tariffs on American-built boats. Yeargin said that its current suppliers have said that they cannot provide the company with American-manufactured aluminum sheet in 2019. He also said prices have risen 30 to 40 percent in the last year. Yeargin said that shortage and price increases will force it to source aluminum sheet outside the U.S. “This case will not increase the sale of domestic aluminum sheet. For us it will lead to the opposite. The impact of this case is devastating to our industry,” he said.